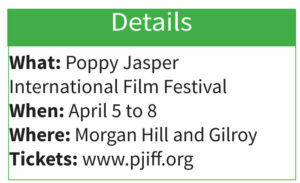 The Poppy Jasper International Film Festival comes April 5 – 8 to the downtowns of Morgan Hill and Gilroy. Movie fans, get ready to meet special Hollywood guests – including a “Star Wars” parody filmmaker – and celebrate film and the digital media arts April 5 to 8 with the Poppy Jasper International Film Festival. This year’s festival will showcase the work of filmmakers from a dozen countries. They’ll compete in 11 categories, during four days of film screenings in the downtowns of Morgan Hill and Gilroy, said Mattie Scariot, festival director. Screenings will be followed by Q&A sessions with filmmakers. Two panel discussions will be held on Friday and Saturday. Running 15 years, the PJIFF is unique because of its global vision, regional market focus, and local opportunities for community engagement. It is the first and only film festival in south Santa Clara County, she said. Film fans will enjoy the bi-city venues, programs and depth of community engagement that are evolving in step with the South Valley’s evolution. The 2018 festival’s keynote speaker will be Randy Spendlove, a Gilroy native who graduated from Gilroy High School and went on in his career to become a prominent Paramount Pictures executive in charge of motion picture music. When Scariot, a friend from high school, called him and described the local community’s enthusiasm for the film festival, he was happy to come and speak in his hometown. Movie-making is a tough, competitive business that’s always evolving and always exciting, he said. Filmmaker Kevin Rubio will be another guest. He created a short film using two characters, Tag and Bink, in a mash-up parody of “Star Wars” and “Cops.” Director George Lucas saw his work and asked him to create a series. Director Ron Howard liked Tag and Bink so much, he’s featuring them in ‘Solo: A Star Wars Story,’ scheduled for release in May. The PJIFF is seeking volunteers from Morgan Hill, Gilroy and San Martin who wish to get involved in the event, Scariot said. People can contact Joan Buccanan at volunteer@pjiff.org. This year’s festival launched a Young Filmmakers Program, teaching local young people how to make short movies using digital technology. The films will be shown at the festival, Scariot said. Youth aged 4 to 14 attended a series of weekend workshops so they could learn firsthand how to make a short movie from start to finish, she said. The Morgan Hill and Gilroy libraries hosted the workshops which were led by filmmakers from the festival and Community Media Access Partnership in Gilroy. “The kids had a blast and their short films will be shown as part of PJIFF,” she said. The festival also added a 40 and Up Film Making experience this year. Filmmakers have greater access to affordable equipment now than ever before, and many have had long time dreams of making films, a big reason the new workshop was added, Scariot said. The program will give adults the chance to see what it takes to make a short film, which will be completed over a period of three Sundays. Adults can join any time during the process, depending on what they are interested in. Register at www.pjiff.org/programs. 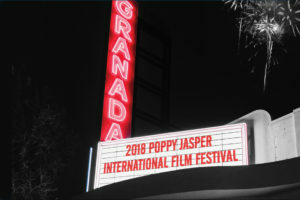 The 2018 PJIFF’s major sponsors include the Granada Theater, the Morgan Hill Downtown Association and the Gilroy Downtown Business Association.